Yesterday, Michee Smith, Product Lead of Google Transparency Report, posted in a blog post that they launched another section to run political ads in the US. The new section is called Political Advertising on Google, which provides information that helps everyone to understand the flow of political advertising online and featuring federal candidates or current elected federal officeholders. 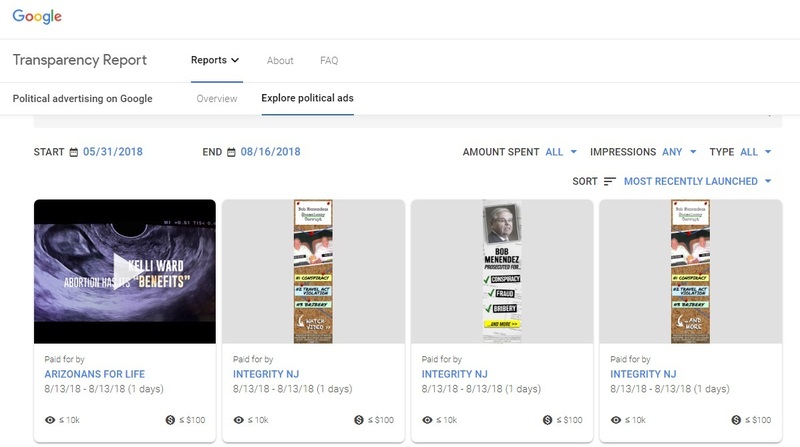 The Political Advertising Transparency Report shows all the advertisers spent in buying political ads on Google Ads Services in the US. The new section has a map with 51 states and its districts. It also shows the estimated money they have spent. Florida has the highest spent in buying political ads with $1,148,900. The top 30 advertisers nationwide and how much they have spent in ads are also included in the new section. The top 1 is the Trump Make Great America Again Committee advertiser with $629,500 the amount spent. At the last part of the new section, it has a top keyword which helps advertisers to know who sees their ads. The ACLU keyword has the highest amount spent on ads with $37,500. The company released the new tool for the security of political campaigns, provide voters with accurate information, and expand transparency on their platforms. The section will be updated weekly.